Named for his blue eyes, and because he was saved near the birthday of Frank Sinatra, Frankie was found along a rural highway in Ohio. A concerned citizen saw him lying in the ditch, unable to move. Three days later, the same good samaritan saw the dog again, still lying there, in 20 degree winter weather, and decided to do something about it. He called the highway patrol who in turn called animal control. The officers recovered Frankie, who was unable to walk and in great pain. Evaluating his condition, they estimated that the poor dog had been there for as long as a week, somehow clinging to life without food or water and exposed to the winter elements. When rescued, he weighed just 30 pounds. He was neutered, but had no microchip. Frank landed at the animal control shelter, where a kind volunteer learned of his situation. 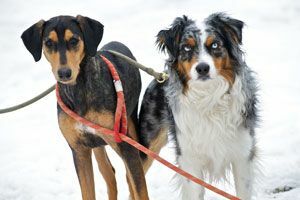 After checking the Internet and newspapers, she determined that no one had lost a neutered male Australian shepherd. The shelter gasses unwanted or unclaimed strays that volunteers cannot find homes for. This was the schedule for Frankie, who could not walk and was incontinent, when the required hold for stray animals expired. Late one night in mid-January, we received a desperate email from volunteers: if we could help Frankie, who was paraplegic and would need his bladder expressed, we had to let them know by 8:00 a.m. the next day, or he would be put down. The volunteers said they would bring him to a veterinarian to be euthanized by lethal injection, so he would not have to be killed in a gas chamber at animal control. At this point Frankie had received no additional medical care. He had been sitting, for over a week, with the terrible injuries. With less than 12 hours to gather any further information on the dog, his temperament, or his medical status, we had to make a decision. Other rescues and shelters that the volunteers contacted either did not respond or had turned down their requests for help. Home for Life® told the volunteers to send Frankie our way. A few days later, Frank arrived at our sanctuary courtesy of Pilots N Paws. Once they knew that Frank had a future, the Ohio volunteers sought preliminary veterinary evaluations of his condition. They learned that his right femur had been fractured, but that is all we knew at the time that he departed for Minnesota and Home for Life®. Everyone who met Frankie along his journey were impressed by his will to live and his stoicism: despite his injuries he was very gentle and never tried to bite. Our first step was to bring Frank to our local vet, who discovered that, in addition to the badly fractured femur, Frank had a completely dislocated left hip. Because of the time that had elapsed since the injuries occurred, surgical intervention was necessary. Just a week after we had accepted him, Frankie was in surgery at the University of Minnesota Veterinary Medical Center, where renowned orthopedic surgeon Dr. Betty Kramek repaired both the right femur and dislocated hip. Dr. Kramek elected to repair both injuries at once so that Frank would be able to walk rather than risking further injury to either side. Frank's surgeries were done at the same time and both procedures were very successful. Thanks to the generous donors who contribute to our Emergency Medical Care Fund, we had the funds available to help Frankie, and pay his veterinary bill at the University and at local clinic: the total was over $4000. Not much is known about Frankie's background, but the vets estimated his age to be about four years. Another interesting observation made by his veterinary nurses was that Frank is deaf. This impairment may explain how he came to be hit by a car; he may not have heard the sound of oncoming traffic. Frank is able to go to the bathroom on his own, and Dr. Kramek thinks he will be able to walk again after he recovers from surgery. Frankie does tend to walk with his right hind paw knuckled under. Our staff applied hot packs to his hip and thigh and they do physical therapy exercises with him to help his leg muscles regain extension and flexibility. In the summer, he also goes swimming at the Apple River. Frankie is now best friends and roommates with another dog who benefited from the Emergency Medical Care Fund—the tiny Doberman Juliet, who was confiscated by police in a neglect case and came to Home for Life® with several medical problems. With the skilled veterinary care Frank received, and the dedicated attention of our staff, Frank needed to use a wheelchair for only a few months before regaining mobility. In addition to hydrotherapy, Frank now receives treatment with a cold laser several times per week. As he has aged, Frank has developed soreness from arthritis at the site of his prior injuries, and wants to walk with most of his weight on his front legs. In order to keep him as active and pain free as possible, we use the laser, a safe and non invasive form of treatment, to help heal and restore the tissue and muscles. All these strategies enable Frankie to enjoy the best quality of life possible after surviving the near loss of his life and undergoing the complicated surgery and recovery. Frankie's case raises an important question about animal rescue and our philosophy at Home for Life®. Why direct so many resources to helping one single animal? The sum required to repair Frank's injuries could have been used to help several animals. Where resources are limited, helping as many animals as possible is a legitimate focus. However, Home for Life® believes that saving animals requires a multifaceted approach. Moving numbers of animals through adoption addresses in just one facet of the problem. An exclusive focus on numbers, however, exempts many deserving animals. Sanctuaries like Home for Life® play a vital role in animal rescue by focusing on the individual animal and its unique needs. Frank was hours from losing his life when Home for Life® stepped forward to help him. Sanctuaries whose focus is on the individual animal provide a depth of care and a life-saving, life-affirming alternative for these special animals. If you would like to sponsor Frankie, please click here.